From time to time we hear people – friends, family and clients – repeat the old saying that “ignorance is bliss” but is this really true? 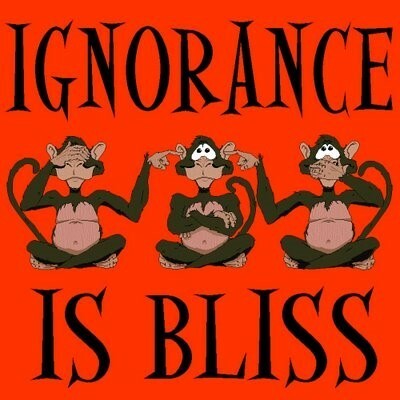 Perhaps, in the short term, ignorance may be bliss. It’s certainly the easy option. Whether it’s carrying on oblivious to what we’re doing. Or the deliberate turning of a blind eye. But how about the longer term? And it can be very long term. Months, years or decades later. When the chickens come home to roost; the consequences of our actions – or inactions – become apparent. While it may not be fashionable to say it these days, each one of us is responsible for the way we choose to live our own lives. And the key word here is CHOOSE. So often we hear people saying that this is all very well in theory but, in practice, they didn’t have a choice. But this isn’t the case. There are ALWAYS choices. What they really mean is that they don’t like any of the options available to them – or ones that were immediately apparent. And they don’t want to put in any time or effort into seeing whether there was another way open to them. So they made the choice they did, whether consciously or unconsciously. Oh and doing nothing – or turning a blind eye – is just as much a choice, albeit a less obvious one. We know that this may all sound like a huge burden to some people. One they would rather avoid. But have you ever considered how powerful this makes you? Rather than letting someone else make the decisions for you, you can take the controls yourself. Taking the time to make decisions that are right for you – or the best available – rather than going with the crowd. Creating your life as you want to live it. It simply means being aware of the choices you’re making. Or not making. Whether they’re big or small. Ones you actually think about. Or do on autopilot. Taking a moment to consciously look at all the options, perhaps doing a little research, before making the best choice available to you. This doesn’t necessarily mean that it’ll be exactly what you want, but it will move you generally in the direction you desire. And this applies whether you’re choosing what to eat for lunch or looking for a new home. This means that you’ll quickly regain the skill of thinking for yourself. And begin to know what’s best for you. No longer automatically assuming that just because everyone else does it – or someone on the TV or in the papers has said it’s a good thing – that it’s necessarily the right thing for you too. We know this may sound like hard work to start with but, like any new habit, it quickly becomes automatic. And, before you know it, you’re back in control of your life. Making decisions that are right for you. As someone so beautifully put it, ignorance is cheap in the short term but expensive in the long term.